Considered the best of the playwright's Irish dramas, the play concerns a Fenian under the sentence of death who is saved from the British and a rival by the title character, originally played by Boucicault himself. 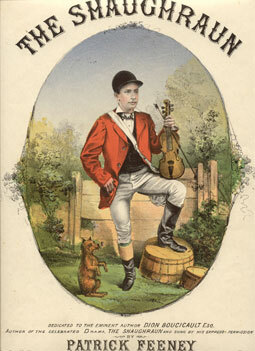 First performed at Wallack's Theatre, New York, November 14, 1874. Brother and sister Robert and Claire Ffolliott are the last remnants of their once-rich family in 1867 Suil-a-beg in County Sligo. At the death of their parents, the local cleric Father Dolan and local squire Corry Kinchela are entrusted with the futures of the Ffolliotts and their estates. Kinchela, however, has designs of the estate and on Robert's fiancée Arte O'Neal and sets up Robert to be arrested as a Fenian. His scheme is successful in that he gets Robert exiled to Australia, but he still must oust Claire and Arte from the estate and obtain Arte's hand in marriage. But, Robert's boyhood friend Conn the Shaughraun has a plan of his own. He wants to bring Robert back from exile and this is something that Kinchela and his cronies will battle to prevent. Into this mess walks Captain Molineux, an English officer. Despite his inbred bafflement at the ways and words of the Irish, Molineux finds himself enamoured of Claire. Robert, a political prisoner, escapes from jail, and is re-captured by Molineaux. Conn (the Shaughraun) succeeds in breaking Robert out of prison. He has to pretend to be dead when Kinchela and his henchmen think they have shot him, and he must keep up the charade during the big Irish wake his mother has prepared for him. Robert is found to be a free man even though he has escaped from prison. The girls are kidnapped by Kinchela and through roundabout circumstances the Shaughraun saves them at the last minute.